Slashing government spending now is just going to make our nation poorer. With the Friday the 13th December deadline for a federal budget deal, the cries of “we’re broke,” and “we can’t afford to keep spending,” are ringing again. But we’re not broke and acting like we are is making us poorer. One of the biggest common misunderstandings is that governments are like households, which need to tighten their spending when times are tough. Actually, governments and households work in opposite ways. Governments can and should spend more when times are tough. Government spending makes up for lack of spending by families and businesses, and it helps get the economy moving by getting people back to work, putting money in their pockets, and contracting with businesses. If we needed a reminder of that, the recent government shutdown gave us one. Journalists reported story after story about how business was down, as federal workers were laid off and national parks closed. The estimates are that even though the shut down only lasted 16 days, it cost the economy $24 billion. We need government spending and investment to get the entire economy moving forward. When families are back at work with decent wages, government tax revenues will rise and spending on social supports will fall. That’s when government can reduce spending without slowing down the economy. During the past two years we’ve reduced the deficit by half, close to 2008 levels. That may sound like it’s a good thing, but it’s really the biggest reason the economy is so lackluster for the vast majority of Americans with a near-record-high in unemployment, stagnant wages, and a smaller proportion of Americans working than any time in the past 30 years. We’ve also cut all the wrong things: spending that puts money in people’s pockets today and investments in our economic future. We’ve cut spending on education, unemployment insurance, environmental protection, and scientific research. Our public investment, which includes annual government programs and spending on roads, bridges, transit, research, and development is actually the lowest it’s been as a share of the economy in 60 years. What if we’d taken a different course during the recession? How about rather than cutting spending after an initial stimulus, which avoided a second great depression by saving three million jobs, the government had kept at it? History shows that if we have continued the levels of spending normally done after recessions, we would have spent some $800 billion more than we did, and the overall economy (and not just the stock market) would be back to the same level today that it was before the recession hit. In short, the argument that the government must live within its means to protect our children’s future is backwards. Averting deficit spending now means starving our children’s present and their future. More parents will have to struggle to get by, fewer good jobs will be created, education will suffer, and today’s college students will stumble into their careers saddled with huge debt loads. And our infrastructure will keep crumbling and research will dwindle, making it harder for our businesses to compete in the global marketplace. There are ways we can reduce the deficit without slowing down the economy very much, if at all. That is by looking at the other truth about the cry that “we’re broke.” In fact, we have been robbed. When Uncle Sam gives big corporations tax breaks to move jobs overseas, we’ve been robbed. When Washington taxes billionaires at a lower rate than their secretaries, we’ve been robbed. To get the country moving again, Congress needs to reverse direction and increase spending on vital services and investment. That means reversing the budget cuts on domestic spending already in place and stopping any more sequestration cuts on vital services for our families. And raising taxes on the wealthy and huge corporations, which have been gaming the system at our expense. Instead of obsessing about the “need” to cut government spending, our leaders should be figuring out how best to stimulate the economy to provide both a better today and future for our children. Richard Kirsch is a senior fellow at the Roosevelt Institute and the author of Fighting for Our Health: The Epic Battle to Make Health Care a Right in the United States. He’s also a senior adviser to USAction. USAction.org. Distributed via OtherWords. OtherWords.org. 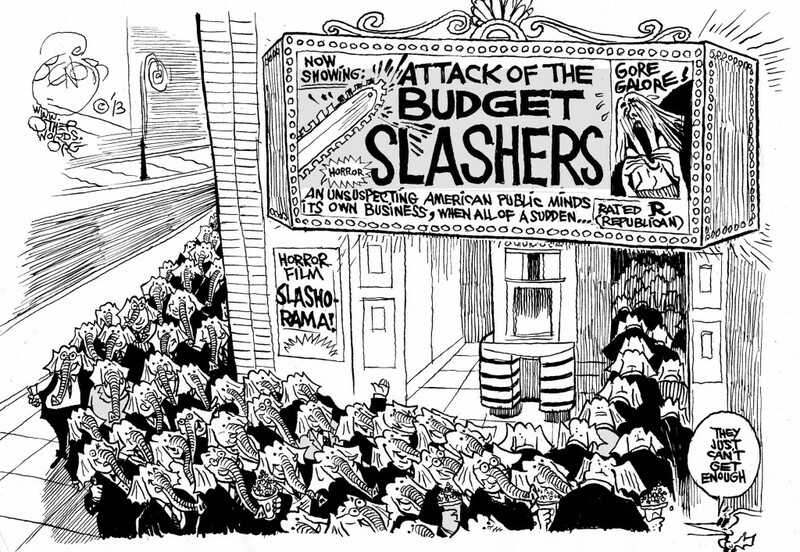 Cartoon Credit: Attack of the Budget Slashers, an OtherWords cartoon by Khalil Bendib.